She had never made it without trying (unsuccessfully) to substitute several healthier ingredients like applesauce (she doesn’t recommend it…). I had never even attempted it. 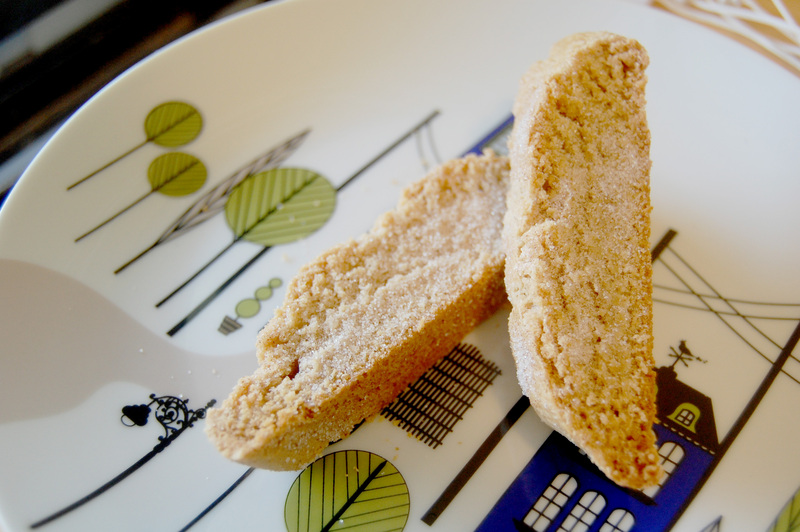 But that afternoon, Kelsey Beth and I set out to make cinnamon sugar biscotti. I used a recipe from one of my all-time favorite food blogs, Annie’s Eats. The recipe actually calls for a lot more sugar and cinnamon in the topping, but it also means you’ll have way more cinnamon sugar left over than you know what to do with. Even my adapted version will probably leave you with excess, but at least it’s a little better. As we were making them, we were a little doubtful of how they would turn out, since they started out so oddly shaped and small. 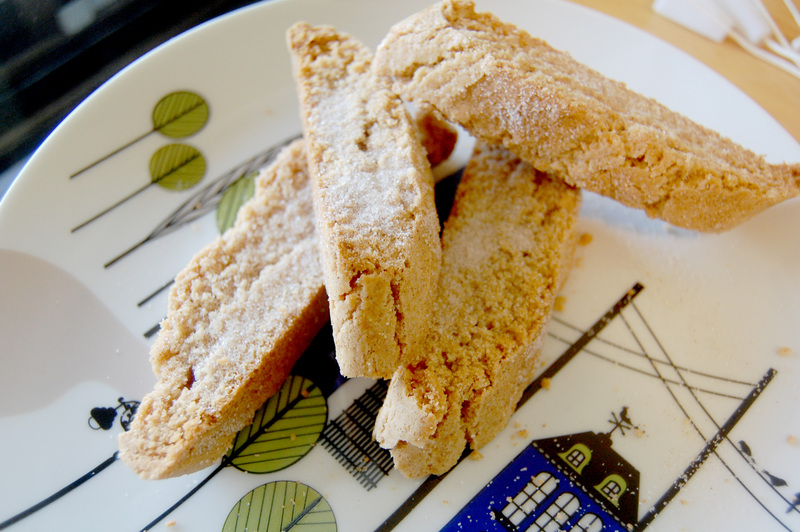 We were pleasantly surprised, however, when they puffed up perfectly and sliced into neat little fingers of biscotti. Preheat the oven to 325° and line a baking sheet with parchment paper. Combine the flour, cinnamon, baking powder and salt. Set aside. Cream the butter and sugar together (in a separate bowl from the flour mixture) on medium-high speed (we used a handheld electric mixer) about 3-4 minutes or until fluffy. Blend the egg and egg yolk into the butter mixture, and then add the vanilla. Reduce mixer speed to low, and mix the dry ingredients into the butter mixture. Break the dough in half, and shape each half into a log about 9 inches long and 1 1/2 inches wide. It will probably fall apart while you shape it, but just be gentle and try it again. It doesn’t have to be perfect. Place each log on the baking sheet about 3-4 inches apart. Combine the sugar and cinnamon for the topping. Brush the top of each log with the egg mixture and sprinkle with the cinnamon sugar topping. Bake 40-45 minutes (halfway through baking, rotate the baking sheet so the back part is moved to the front). Remove the logs from the oven and let them cool just enough to handle. Slice at an angle to achieve about 10-12 slices per log (Yes, it is possible. No, unfortunately I did not get a picture of this part.). I had only eaten biscotti a few times in my life. It just wasn’t a food I normally thought of. This recipe may have just changed all that. We dipped it in hot chocolate, but it was wonderful by itself too; it wasn’t dry or flavorless at all. Our husbands arrived just as we took the biscotti out of the oven (perfect timing, huh? ), so they got to try it too. We split the leftover biscotti and sent Kelsey Beth & co. home with a bag of it. The next day, we found out that both parties (us and them) had both ended up completely finishing the biscotti that very night.